The EUROCLIO project in Bulgaria has its focus on school history and would like to develop an increased intercultural and also international dimension in the learning and teaching of history in this country. The target group is a wide network of historians and history educators which include history teachers, history teacher trainers, textbook authors, curriculum developers, inspectors, advisors and local authorities on the learning and teaching of history.The overall aim is to strengthen the international context of an inclusive Bulgarian history education in order to support the integration of Bulgaria into the European Union. The EUROCLIO project in Bulgaria has its focus on school history and would like to develop an increased intercultural and also international dimension in the learning and teaching of history in this country. The target group is a wide network of historians and history educators which include history teachers, history teacher trainers, textbook authors, curriculum developers, inspectors, advisors and local authorities on the learning and teaching of history. Some of them are already influential in the school history education system; others carry the potential to be vital players in the future. A group of key persons in history and history education in Bulgaria are invited in development, training and networking seminars in order to develop innovative, alternative and inclusive teaching materials. The work will culminate in the publication of a course book with innovative material to strengthen the international context of an inclusive Bulgarian history education in order to support the integration of Bulgaria into the European Union. 4 development and training seminars (Sofia, Plovdiv) The first Development and Training Seminar was held in December 2006 in Sofia, and focused on the question: What expectations do we have for a Project on an inclusive and international approach for the Learning and Teaching history in Bulgaria? Other Development and Training Seminars focused on the state policy and human rights. 4 implementation and dissemination seminars (Sofia, Burgas, Vratsa) for key persons in history education including teachers, trainers, textbook authors and other specialists. 3 Annual Meetings of the renewed BGHTA were held in Sofia. On top of this; 4 authors and experts workshops were held in Sofia, Borovets and Veliki Turnovo. They were appointed to devise the worksheets Fair and Balanced History. During the piloting phase (March‐June 2008) 446 students and 21 teachers used the education packs in the cities of Teteven, Plovdiv, Krivodol, Mezdra, Sofia, Vratsa and Pleven. Over 100 history educators are trained to implement the materials into school. Altogether 400 history professionals, civil servants, and experts contributed to and benefited from the 3 year activity. The pack of 44 innovative worksheets for active work in classrooms include innovative lesson methods on topics from Bulgarian and general history based on different perspectives. The impact of this project on the society is difficult to measure. There remains a distinctly polarised opinion toward minorities, particularly the Roma, provoked by political forces and the media. Although an innovative textbook on the history of everyday life, migration and multicultural history has been created, sensitive and controversial historical episodes and issues could not yet be addressed properly because the environment hasn’t been ready for this. The issue of intolerance has been growing over the past years and has been intensified by the economic crisis. 25 percent of the respondents on the questionnaire stated they found it difficult to apply the innovative materials that respect diversity in a practical sense. Overall, still considerable improvement in Bulgarian history education needs to be accomplished. 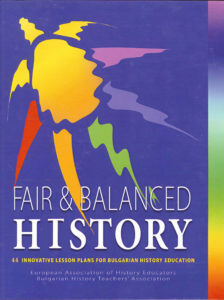 Therefore, the BGHTA is continuing to develop worksheets, in collaboration with other regions in Bulgaria, using Fair and Balanced History as an exemplary model.